Rope Access or Abseiling Access is the most flexible, cost effective means of carrying out any sort of difficult access, or height safety oriented Building Maintenance or Remedial Building Works. Our highly trained Abseiling Personnel are experienced and equipped to carry out any sort of remedial building repair and maintenance projects that you may have at your building or structure. Call us to find out how we can assist with your next Rope Access project! 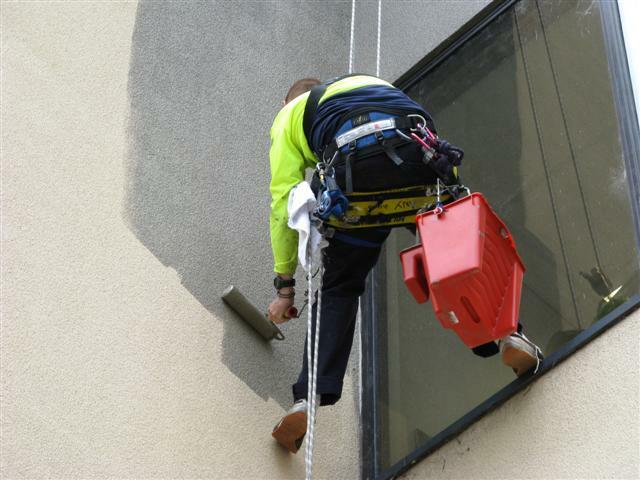 Industrial Rope Access personnel can be deployed on any structure to provide full high rise painting services without the need for additional costs in hiring access equipment. Typically, works such as Painting and Concrete Repair are carried out using scaffolding, swinging stages, and elevated work platforms. Money can be saved by utilising established, safe abseiling techniques to carry out these types of works, whether a small remedial project, or a full building make over. Call us on 1300 789 474 today to find out how we can assist with your Painting project. Advanced Solutions Group – Challenge Us…. We Look Forward To It!!!!!! Do you undertake maintenance for your property on the roof area and need anchor points, roof access walkways or work platforms installed to ensure adequate and OHS compliant access is maintained for your rooftop plant areas? Call us today on 1300 789 474 to see how we can assist with Roof Access and Height Safety. Abseiling Window Cleaning plus Abseiling Painting. As well as Abseiling Concrete Repair, in addition to Abseiling Building Maintenance. Not withstanding Abseiling Survey or forgetting Abseiling Access we install Abseiling Anchor Points but don’t forget Abseiling Facade Maintenance or Abseiling Industrial Works. When you think about these things, think about Advanced Solutions Group! Visit our blog and enquire about our services. Think about Anchor Point Installation or Anchorpoint Installers by height safety technicians and system certification Services in Sydney and beyond, throughout Australia. Our expert abseiling personnel are trained in all aspects of concrete repair, industrial rope access, facade maintenance, abseil maintenance as well as various fields and sectors within building maintenance services. We are proud to be able to undertake many different projects in the building services industry. Industrial Rope Access saves money, cost effective solutions for building maintenance. Advanced Solutions Group 1300 789 474. High Rise Painting can be carried out without huge equipment costs. How? The answer is simple. 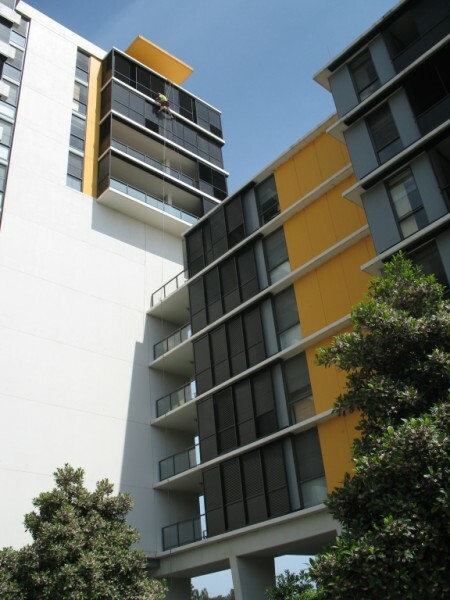 We specialise in High Rise Painting without using expensive stages or scaffolding. We have undertaken literally thousands of painting and other building maintenance projects and continue to be known as a provider of cost effective solutions to the building maintenance and services sector. Find out how we can save you money on High Rise Painting projects today. Call us on 1300 789 474. High Rise Painting by Abseiling Saves Money! Industrial Rope Access Survey Services are the most cost effective means of establishing the scope of works required on any structure. Our expert team of abseiling personnel can conduct a Rope Access Survey to assess the exterior areas of your property or structure that will provide you with a comprehensive and detailed report on what may need to be done to rectify any issues of concern, or to check previous works integrity. Call us today on 1300 789 474 to see how we can assist with a Rope Access Survey of your building. Industrial Abseiling or Industrial Rope Access as the industry refers to it, is a cost effective and easy way to undertake maintenance and remedial building works while limiting disturbance to tenants, increasing access advantages & limiting the cost of expensive hire equipment traditionally used for access. Why not take the time to discuss your remedial building and maintenance needs and see if we can assist with your project. Our quotes are obligation free and we strive to provide transparency and full information about project proposals. Our prices are competitive and we are proud to house such an experienced and skilled team of Industrial Rope Access Technicians. Advanced Solutions Group – Challenge Us…..We Look Forward To It!!!!!!!!! Are you unsure or concerned about your height safety needs? Our highly trained and experienced Height Safety personnel are able to offer a range of different services in the area of height safety system installation & testing. Whether it’s anchor points, static lines, access walkways or any type of fall arrest equipment – we are able to provide cost effective solutions for your height safety needs. Working at heights is serious business and safety is critical. Don’t gamble with the lives of workers. Ensure that your height safety obligations are met. Call Advanced Solutions Group to find out how we can assist with your Height Safety project on 1300 789 474. Do you require High Rise Window Cleaning Services via Industrial Rope Access or Abseiling? Advanced Solutions Group provides cost effective window cleaning solutions for those hard to reach, exterior facade windows and glass structures. Our experienced and well trained window cleaners are able to work in a very timely manner and are known as some of the fastest rope access window cleaners in the country. Please call us today on 1300 789 474 to see how we can assist with your Industrial Rope Access Abseiling Window Cleaning needs. Our highly skilled team of Concrete Repair Specialists are able to provide you with first class concrete repair services, whether it’s just a small patch of concrete you require to be repaired, or if your building is dropping render and concrete like there’s no tomorrow! We have expert concrete repair personnel who are not only able to undertake normal ‘ground level’ concrete repairs, but are skilled and experienced in undertaking major concrete and render repair projects while abseiling at height. Concrete facade repair and maintenance is one area in which our expert abseiling personnel are able to offer competitive, high quality and cost effective services. If you have a concrete repair project that you feel we may be able to assist with, please call us today on 1300 789 474.